Royal Highlands by Pringle is an active adult community located among rolling hills in Leesburg, Florida. This world-class golf community sits on just under 1,100 acres, with nearly 35 percent of the land set aside for conservation. The natural preserves are a home to native birds, waterfowl, and other wildlife. There are four lakes on-site where Royal Highlands residents can go fishing and canoeing. The crown jewel of this gated community is the Monarch golf course, where Royal Highlands residents get preferred rates and tee times. Members of the public are allowed to play with a resident. 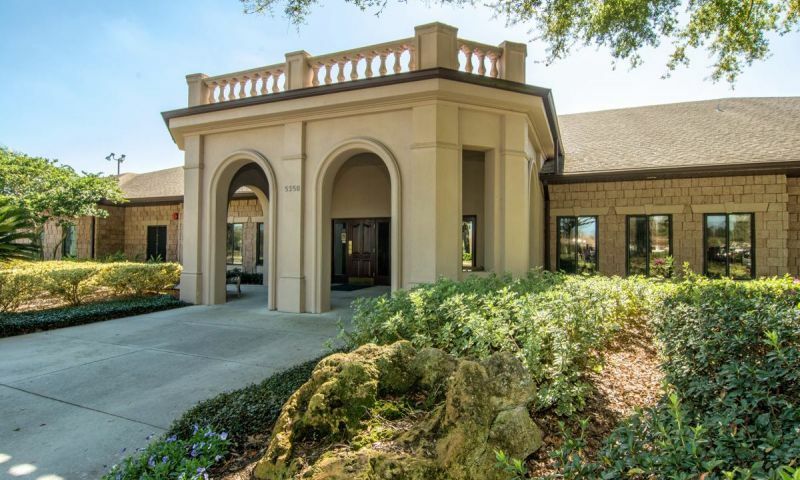 Beautifully designed around this golf course, Royal Highlands in Leesburg Florida is located close enough to urban conveniences, yet provides serenity in a country setting about ten minutes away from downtown Leesburg. The mild three-season climate and low crime rates of the greater Leesburg area make Royal Highlands a perfect place for Baby Boomers. Royal Highlands has two clubhouses. Indoor amenities include a fitness center with covered pool, card room, arts and crafts room, library, and billiards. There is a restaurant adjacent to the golf course called The Crown and Shield. The Great Hall has a ballroom, stage, and dance floor and is host to many entertainment acts and community functions. An outdoor pool is perfect for soaking up the Florida sunshine. Residents at Royal Highlands can also get together for some friendly competition over a game of softball, tennis, bocce ball, or horseshoes on the scenic outdoor courts. There are also picnic areas, which provide easy access to community lakes. The 18-hole, par-72 championship Monarch golf course features picturesque lakes and rolling hills and is a challenging, but fun way to spend part of the day. Multiple tees insure that everyone can play at his or her level. Construction of Royal Highlands in Leesburg Florida began in 1999 by Pringle and was completed in 2005. A total of 1,500 single-family ranch-style homes make up this 55 and over community. Throughout the construction of Royal Highlands, Pringle offered several dozen different floor plan designs. As a result, current homebuyers will find a wide range of different models on the resale home market. Houses range in sizes from 1,100 to nearly 3,000 square feet and are available on a resale basis. Some homes include premium lots with views of the golf course or the protected land. Other available options are homes with three-car garages or in-ground pools. Many houses at Royal Highlands have screened in porches. Housing prices vary accordingly, but start out fairly affordable. Residents at Royal Highlands definitely enjoy a desirable country club lifestyle. However, there are many other ways to spend the days. The Great Hall for example is a very busy place. A full-time activities director plans monthly breakfasts, holiday parties, and other special events. Residents also are involved in many plays and concerts throughout the year. There are dozens of established social clubs at Royal Highlands, with the following interests represented: arts and crafts, sports, cards, computers, dancing, singing, health, alternative health, regional, travel and more. Leesburg, Florida is conveniently located between Ocala and Orlando. This area offers a lot in scenic beauty, shopping, restaurants, and medical facilities. Ocala is very family friendly and offers countless options of different restaurants and ongoing events. For family entertainment, Ocala features year round theater performances, concerts, public festivals, dance recitals, and special museum exhibits. When the grandchildren come to visit, Orlando is the perfect destination to enjoy Disney World, Universal Studios, Sea World, and Busch Gardens. For beach getaways, the Gulf of Mexico is only 45 miles to the west, and Atlantic coastal beaches are 90 miles away to the east. The Recreation Center is the main clubhouse for residents in Royal Highlands. The Great Hall is where community events and entertainment are held for residents. There are plenty of activities available in Royal Highlands. Here is a sample of some of the clubs, activities and classes offered here. Construction of Royal Highlands in Leesburg Florida began in 1999 by Pringle and was completed in 2005. A total of 1,500 single-family ranch-style homes make up this 55 and over community. Throughout the construction of Royal Highlands, Pringle offered several dozen different floor plan designs. As a result, current homebuyers will find a wide range of different models on the resale home market. Square footage information is not available for some models. We looked at Pringle communities on recommendations from other folks we knew, starting in 2003. We looked at six areas around Leesburg, settling on a beautiful building lot in Royal Highlands. We moved into a rental home while we watched our own custom designed home being built. We have been in our home since 2005 and we love it. Our home-based, customer-service business is here and our yard is a Florida friendly bird and butterfly paradise. Loads of activities for all levels of involvement. If you are bored here, it's all on you. Come, visit, see, stay! Moved here from up north a couple of months ago.My wife and i love it,we have to get use to the weather but it better then cold and snow.our house is just what we were looking for.All the extras are great,the pool pool room.Our neighbors are very nice and have made us feel at home.The community is very well kept.I love the kranes too.We feel this is the best move we ever made. Great 55+ community. Great Hall clubhouse is nice and amenity area has a great pool. Golf course is respected and the open space is serene. Recommend! Love that there is a indoor and outdoor pool here. Tons of nice people live here and everyone is friendly. Moved in May of 2014. Been having a blast. Neighbors have been great and community is awesome. We've been at Royal Highlands for only five months and have fallen in love with the community. There are numerous clubs and organizations which perfectly complement the full suite of amenities available to residents. Come, visit, and enjoy community living. From the moment we drove into the community, we felt at home. Everyone is friendly, helpful, and very informative. The community is well landscaped with trees and flowers, there are lakes and wet lands that attract birds. There are so many activites from which to choose. Whether your preference is sports, games, music, dance, fitness, arts and crafts or gardening, or nothing at all you will find just what you want at Royal Highlands! My wife and I looked at houses in five PUDs before selecting one in Royal Highlands. It was not our favorite house but Royal Highlands really sold us on their amenities and available activities. The people we met were the friendliest we could have anticipated. I have been at Royal Highlands for a couple years now. It's very quiet and well maintained. The people are very friendly and I am involved in lots of the clubs. The golf course is very nice and the restaurant is one of my favorites. 55places.com is not affiliated with the developer(s) or homeowners association of Royal Highlands. The information you submit is distributed to a 55places.com Partner Agent, who is a licensed real estate agent. The information regarding Royal Highlands has not been verified or approved by the developer or homeowners association. Please verify all information prior to purchasing. 55places.com is not responsible for any errors regarding the information displayed on this website.